221 Main St. in downtown La Crosse has convenient parking in the city parking ramp (3 hr. FREE parking) and a pick-up window at the back door. Call us at 608-785-7200 or Fax: 608-782-7335. 225 Sand Lake Road - Center 90 in Onalaska. Service with a smile. Stop in and pick-up some subs on the way home from work. Or dine in our NEW expanded dining room. Call us at 608-783-SUBS (7827) or Fax: 608-783-5168. 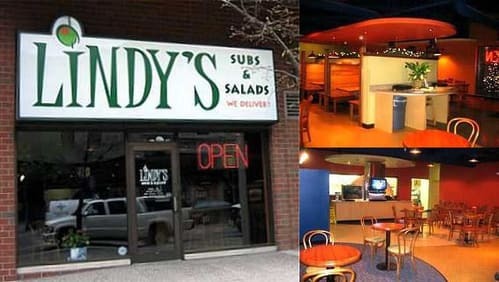 Give Lindy's a call for your catering needs. We have fresh, made to order party platters of all our subs, salads and wraps. Perfect for business meetings, office parties, birthday parties, picnics, sales luncheons, wedding day lunches or anytime you need fresh food fast!! We can do it all. Download our full menu: eat in, take out or delivery. Page Summary: Lindy's Subs & Salads offers food delivery, restaurants that deliver near me, catering and sandwiches. Products available in our sandwich shops include sandwiches near me, carry out near me as well as fast food delivery. We also specialize in family restaurants, restaurant delivery in La Crosse, Onalaska, Holmen as well as West Salem. Other areas we serve include La Crescent MN and beyond.